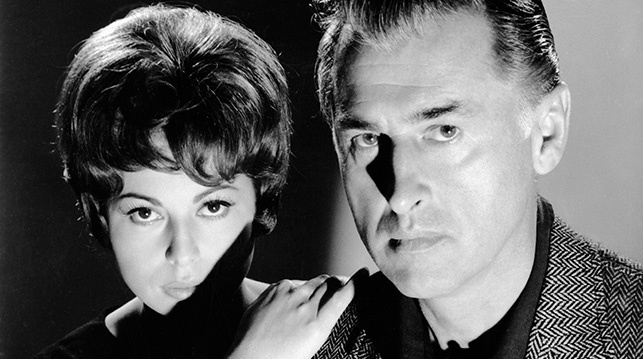 THE SECRET PARTNER (1961) is a British suspense thriller starring Stewart Granger. It was just released by the Warner Archive. Granger plays John Brent, a shipping company executive whose wife Nikki (Haya Harareet) has just left him. Nikki thinks John is spending money on another woman, but he's actually being blackmailed; it seems that Brent once committed a crime under another name. The blackmailer is in turn himself being blackmailed! When money is stolen from Brent's company, suspicion falls on him. It's up to the police detective (Bernard Lee) to put all the pieces together. I enjoy Stewart Granger and British crime films so I had high hopes for this film, but alas, it turned out to be a rather dreary affair. Granger's character has the trappings of a nice life but is ultimately a loser, in more ways than the viewer even realizes at first. He's a stupid and not particularly sympathetic man. Harareet (of BEN-HUR) is terribly boring (that might be an understatement), and only Lee as the detective manages to liven things up when he's onscreen. 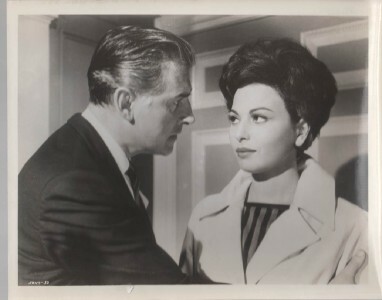 The plot of this 91-minute film has some twists and turns, including the reveal of the "Mr. Big" (the "secret partner") behind the entire blackmailing and robbery plot, but ultimately the film is more sad than interesting. Its main problem is that the only person worth identifying with and rooting for is the police detective, but it's not enough to build a film around. Some of the basic elements were lined up for a good crime film but they simply didn't come together in a way that worked for me. The movie was directed by Basil Dearden from a script by David Pursall and Jack Seddon. It was filmed by Harry Waxman. The jazzy score by Philip Green is a plus. Just a few years before THE SECRET PARTNER, Granger made a film which is somewhat similar on the surface, THE WHOLE TRUTH (1958). THE WHOLE TRUTH is about a man framed for a crime just as his marriage is recovering from his having had an affair. It even has a similar jazz-type score, in that case by John Dankworth. I enjoyed THE WHOLE TRUTH as much as I disliked THE SECRET PARTNER; I haven't seen THE WHOLE TRUTH in years but hope to revisit it in the near future. 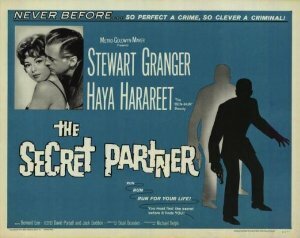 THE SECRET PARTNER is a very nice widescreen black and white print from the Warner Archive. There are no extras.